Our president is Jeff Woodworth (front row second from right), and Rob Halsey is our director (he's the little gentleman in the front row first on the left). 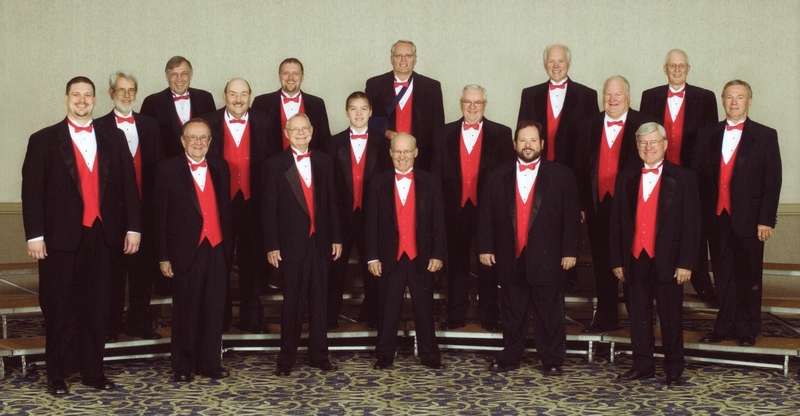 The Battle Creek Chapter of the Barbershop Harmony Society has been keeping barbershop harmony alive in the Battle Creek area since 1942. The Cereal City Chorus and quartets perform at community events and sponsors a Christmas Chorus, (open to any man), and Singing Valentines. It's been featured on PBS and the Andy Williams Christmas Show. Appearances have included hot air balloon competitions, World's Longest Breakfast Table, WBCK Christmas Sing-along, religious services, and nursing homes. Both the chorus and quartets can be booked for performances and fund raisers. Please see our contact page. Highlights of the chapter year include a spring show, featuring the chorus, chapter quartets, championship quartets and other community performers. The chapter also offers an annual quartet dinner show. Battle Creek has hosted two dozen Michigan/Ontario Barbershop Conventions and serveral other district events. Membership is open to all men who like to sing. Prior musical training isn't required; a desire to burst into song in the shower helps. Join us on Monday evenings at 7:00 at the Birchwood Methodist Church. Cornerof Helmer and Gethings in Battle Creek.